Governor Chet Culver today unveiled a list of 90 ideas he says will save the state nearly $1.7 billion over the next five years. The ideas come from a consulting firm Culver hired to review the state budget. Culver will issue executive orders later this week to enact an estimated $128 million dollars in savings for the next budgeting year. “I look forward to quickly signing these orders and implementing these reforms so that we can start saving taxpayer money,” Culver said this morning. The rest of the proposals for the next state fiscal year require legislative action. “I believe we can do all of these things if we have the political will to do ’em,” Culver said. Consolidating the state’s 223 different data centers is one idea. Another calls for changing state purchasing methods to buy commonly used goods in bulk, including the medical devices used by Iowans who get state-paid insurance through Medicaid. 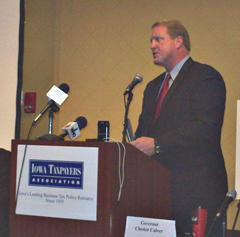 Culver, a Democrat who plans to seek reelection in 2010, unveiled the plans during a midday speech at the Iowa Taxpayers Association’s annual meeting. The governor spoke with reporters early this afternoon, providing more details, such as an effort to encourage local officials to collect fines that are owed to the state. Culver suggests the state may even hire private firms to go after delinquent taxpayers and those who have past-due fines. “And there have been examples that we can show where states or government localities have done that, so that’s an opportunity,” Culver said. House Republican Leader Kraig Paulsen of Hiawatha welcomed the budget-cutting ideas. A copy of the report is posted on the governor’s official website.